Does a return to traffic sense = a measure of normalcy? An interesting story out of Africa this week made me to come to this concievable hypothesis about traffic sense and normalcy. Liberia, a country afflicted by two civil wars that have displaced hundreds of thousands of its citizens and destroyed the Liberian economy, is finally getting stop lights. “The lights, were built by the peacekeeping mission of the UN, have given motorists new hope that normality is returning. 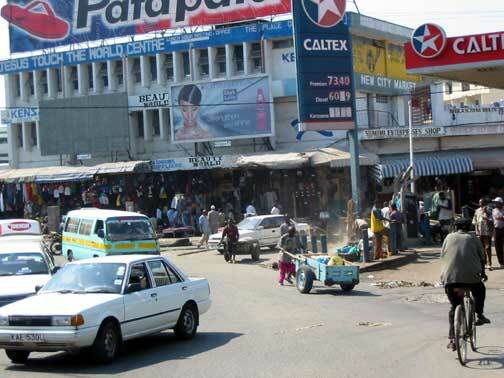 However, the city does not have a regular supply of electricity and so the lights are often out of order. Hypothesis: Perhaps a return to traffic sense is the true measure of peaceful co-existence within a society. Due to an overaggressive cough, I could barely sleep last night, and so I decided to aimlessly spend time channel surfing. In my idle adventure, I came across an interesting show on CNN called Travelogue. This late night episode was about Europeans who have traded their comfy European homes, for the colorful but sometimes challenging lifestyles in the North African country of Morocco. 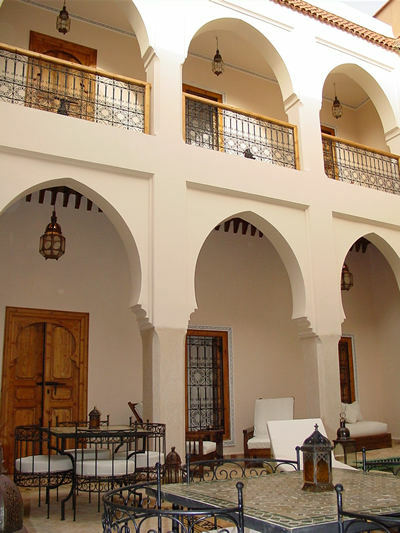 Interestingly enough, hundreds of Westerners, mostly Europeans, are buying up and often extravagantly renovating distinctive homes called riads (Arabic for garden) typically with scented oriental gardens in inner courtyards, in the old quarters of Marrakech and other historic cities like Fez and Meknes to the north. Foreigners rushed to buy riads (Arabic for garden) from the 1960s onwards, led by celebrities like French fashion designer Yves Saint Laurent, establishing Marrakech’s reputation as a playground for the rich and famous. Since Moroccan architecture is more inward looking and given to isolation and intimacy rather than showing off, a riad is a private, cloistered place of escape from the busy swirl outside its thick walls. The walls have colorful tiles and the ceilings have been paintedwith grand and intricate designs by local artists. Many of the ‘Riads’ today are hotels or restaurants and can be viewed at leisure while drinking a cup of famous Moroccan “mint” tea. 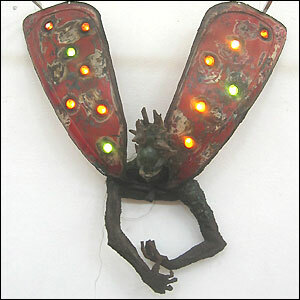 .. Zimbabwe’s "Desire of Ages" Junk Art .. The African Art Scene has always had a vibrant and poetic vibe associated with it. Today I came across some interesting sculptures from Zimbabwe (Southern Africa) on this BBC link. The exhibition, entitled Desires of Ages, is about “a man’s search at any time, within any belief system, for truth about the after-life”. 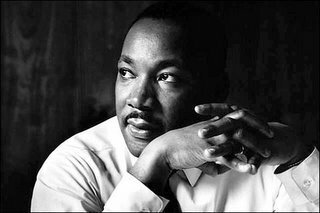 Disco Lights: After the man has emerged from the grave, he bends over to see an angel, whose wings are made from rusting old car doors. Embedded in the wings of the angel, hanging from the wall, are yellow, red and green disco lights. 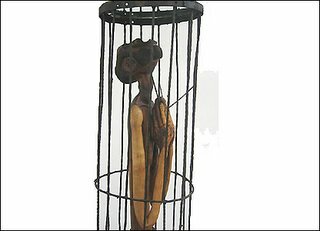 Lamentation: Taurai Gondo’s wire and wood Lamentations speaks of suffering, with a caged figure looking up for inspiration. 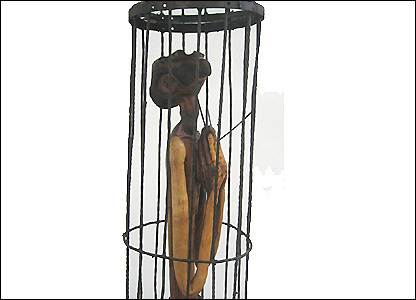 The work speaks of interaction between the living and the dead, a current theme in Zimbabwe. Zimbabwe is renowned for its stone sculpture, but a new wave of urban art made from thrown-away objects is emerging, which often reflects the difficult times the country is facing. The new exhibition shows how skills long used to make toys from old junk have now graduated into a fully-fledged art form. Last night, a nation held it’s breath as the India’s finest batsmen stepped up to the wicket. 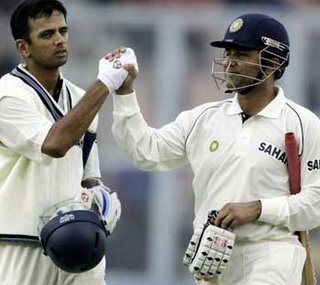 Virender Sehwag — fondly known as the Nawab of Najafgarh, for his dominance at the crease, and Rahul Dravid, India’s captain, walked onto the field with the Nation’s expectations weighing down on their capable shoulders. They were 10 runs away from breaking the cricket world record for “the highest test score partnership by 2 opening batsmen”. The game had been a high scoring game with Pakistan at 679 for 7 wickets — Shoaib Malik (59), Younis Khan (199), Mohammad Yousuf (173), Shahid Afridi (103) and Kamal Akram (103) among others. On Day 3, Dravid and Sehwag had already put up a grand “403” runs against a much celebrated Pakistani team. Day 4 had progressed in angst for all involved as rain had prolonged commencement of this much awaited spectacle. Prem Paniker recounts the anticipation. On January 16, 1956, Vinoo Mankad and Pankaj Roy had opened India’s innings, at the Corporation Stadium ground in Chennai, against New Zealand. They returned with the score of 234 unconquered. When they were separated, the score was 413/1. They faced 997 deliveries, scored 404 runs off the bat, hit 33 boundaries. Similarly, Sehwag and Dravid scored 374 runs off the bat in the total of 403/0 off 462 deliveries, with 65 fours and one six, at a run rate of 5.37. They were three boundaries away from breaking a record that has endured for more than 50 years. Unfortunately the record had to wait for another day. Sehwag fell for 254 as India came off for bad light on 410-1 on a day in which just 14 balls were bowled. Sehwag was caught off the seamer Rana Naved-ul-Hasan with the score on 410, an agonizing three runs short of the 50-year-old record established by two of their countrymen. Despite the turn of events, Indians stand proud that on this gloomy Pakistani day, two of India’s finest captured the subcontinent’s imagination for a short while. The record stands firm .. but not for too long if the Indian team shows such resolve. “Kiefer Sutherland, the superhero of Fox’s “24”, is back as Jack Bauer, a controversial US federal agent who, over the last four years – one day at a time – has saved humanity from terrorists, beaten confessions out of close friends, battled heroin addiction, discovered his murdered wife’s body, and, last year, even faked his own death. All with little regard for himself.